is located at 19 Hall Street, just 7 kilometres north west of Melbourne’s CBD in Moonee Ponds, a thriving hub of commercial, office and retail activity, bordered by quality residential dwellings and excellent lifestyle amenities. and constructed by Vaughan Constructions using Hickory Group's prefabricated building systems, One9 comprises 34, one and two bedroom contemporary apartments over nine levels. in The Hall Street precinct. The local council has designated the precinct as a suitable location for mixed use office, residential and retail spaces. Moonee Ponds is designated for “priority government investment and support” as one of 25 zones to be developed into high density, pedestrian friendly urban centres that are intimately connected to public transport services, in an effort to help reduce urban sprawl and dependency on private motor transport. One9 is one of many projects The Moloney Group is developing within the precinct. The Moloney Group proposes a series of developments constituting a total of approximately 300 new dwellings with a total value of over $100 million. 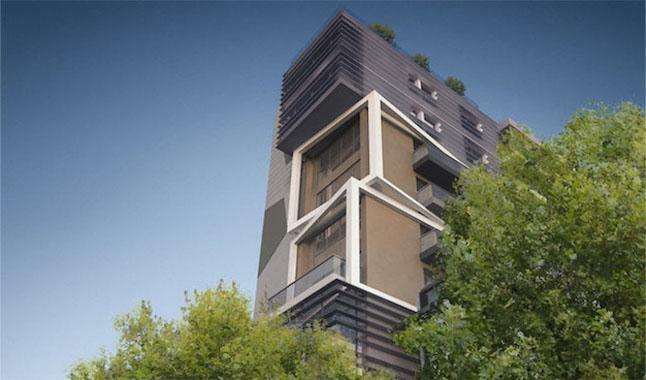 Designed by Amnon Weber, One9 is cutting edge architecture that flawlessly integrates the mixed-use nature of the development into its surroundings, becoming a focal point for a rapidly evolving street scape. One9 features a clean, modern architectural style and high-grade contemporary interiors. One9 apartments offer style and affordability in a fabulous location, minutes from everywhere. Residents of One9 will enjoy a seamless integration of style and quality throughout each of the apartments. Light filled interior spaces that provide practical yet stylish areas for relaxed, easy living. Each apartment features quality fixtures and fittings, high grade carpets and European appliances. All have built in robes, bathrooms, fully equipped kitchens and inviting living area opening onto full length balconies. Floor to ceiling windows create an abundance of natural light, whilst carefully selected colour palettes in neutral tones reinforce a sophisticated and timeless appeal. One9 also features an exclusive rooftop garden, ideal for entertaining with BBQ, comfortable furnishings and lush greenery. The manufactured apartments were erected by Vaughans and Hickory using 36 Unitised Building modules in just 5 days. Vaughan subcontracted Hickory to deliver the 36 modules complete with the facades and fully fitted out with a combination of natural timber floors and high grade carpets, built in robes and full length balconies. The Hickory manufactured apartments offer light filled and functional spaces for everyday living. Unique, modern design highlights the capability of the modular technology to adapt to complex architectural concepts, and features cantilevered terraces on all levels and clean framing on the front façade. One9 was completed in November 2013. One9 focuses heavily on environmentally sustainable aspects. The environmentally sustainable benefits of the UB System are at the heart of what One9 has to offer, which features a 6 star energy rating and a focus on residents taking up sustainable transport alternatives such as cycling, public transport, or a building car-share scheme. Double glazed windows for superior thermal and acoustic performance, grey water recycling and solar hot water panels on the roof also enhance the green aspects of the building. Built with a combination of Aluminium Composite and Designer Panels Diversa Clad System, the facades also incorporate sliding privacy screens for sun protection to the Western Elevation and a floating portal frame to the North Elevation. With a 6 star energy rating, the environmental footprint is significantly reduced. Features include double glazed windows, solar hot water panels on the roof, grey water recycling and many others. One9 encourages the uptake of sustainable transport alternatives such cycling and the significant savings of using a car only when you need one. One9 provides an abundance of bicycle parking and exclusive on site GreenShareCar, an economical, green and easy alternative to car ownership.